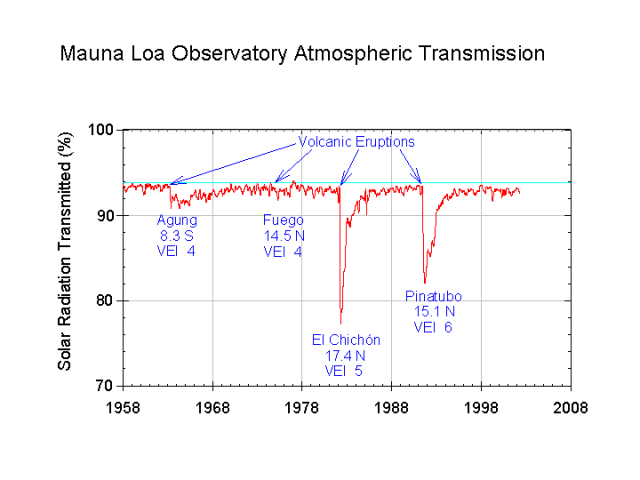 but a proper review shows no warming trend, just short term effects of volcanoes. And then since the page is no longer directly linkable, you have to click on English (or French), then on Weather and Meteorology Home page, then on Climate & Historical Weather, then on Climate Trends and Variations Bulletin. Here is the report's graph of the summer temperatures from 1948 to 2009. The actual data is here. 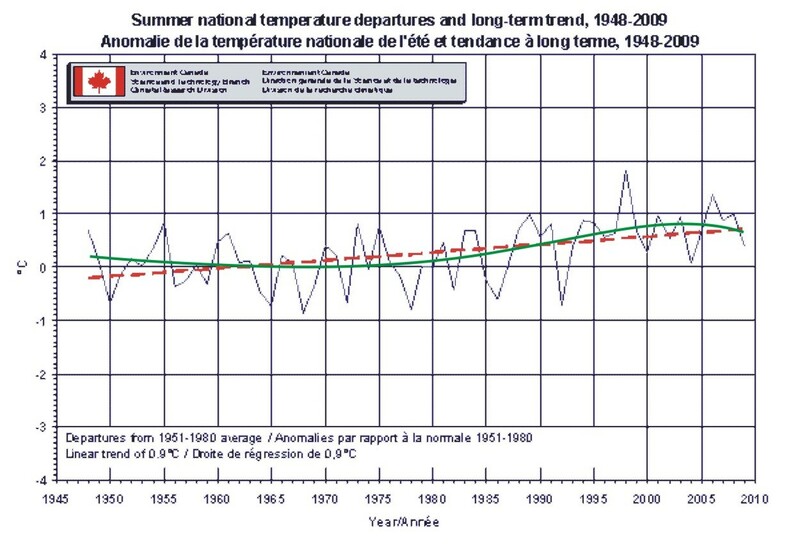 "The graph shows that summer temperatures have remained at or above normal since 1993. 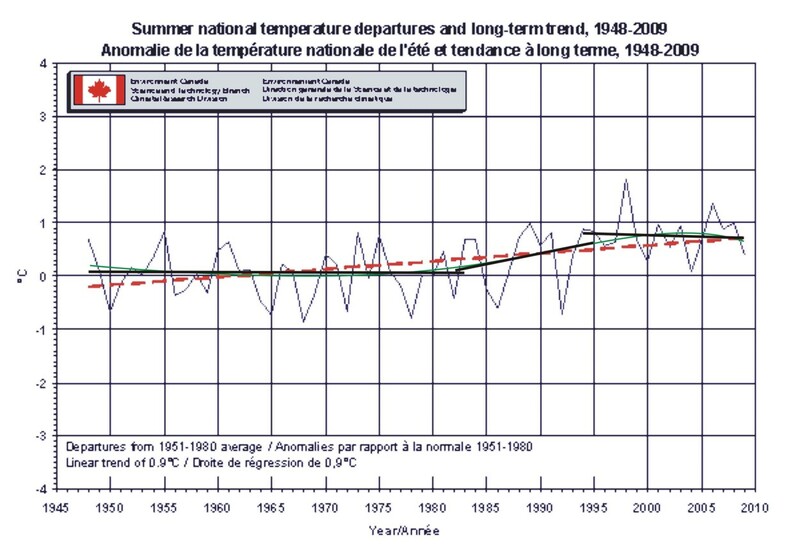 As the red dashed line indicates, summer temperatures have warmed over the last 62 years by 0.9 C."
Environment Canada's straight red trend line shows an increase in temperatures over 60 years. The proper trend line must be done as a 4th to 6th degree polynominal. A straight line trend shows a long term general event if viewed as one set of data from 1948 to 2009. But the world has events that effect the climate in cycles less than 60 years. So it is more correct to view the data on shorter periods, which is easily done by using a polynominal trend instead of a straight line. And remember that the important question is if Humans have any effect on the climate and if the hot years are a long term trend or just a short term event. Both the straight trend and the polynominal are produced by MS Excel by right clicking on the data lines and selecting trend. Not difficult to produce. The polynominal trend shows approximately a ten year averaging trend, and clearly shows the climate nearly constant or Cooling from 1948 until 1982, then experiencing a jump in 1983 and after the event passes, it is again COOLING from 2002 onwards. If the climate is heating from Human activity, then it could not be cooling since 2002 nor could it have been constant or slightly cooling from 1948 to 1982.
its not a general increase, but some cooling and some rises. A better trend analysis will be seen if you break the data into three sections: 1948 - 1982, 1983 - 1995, and 1995 - 2009. Then even straight line trends show a constant average temperature from 1948-1982, a sudden rise in 1983, and a decreasing trend since 1995. One needs to ask why there is a line listed in the graph as the "Average" to show the "increase". The average is simply the data from 1948 to 1982. Environment Canada is perfectly aware that the data for those years is constant and that an event happened in 1983 to change things. Nothing to do with human activities: in 1982 the volcano El Chichon erupted, spewing millions of toms of dust into the atmosphere. Before the dust settled (it takes about 5 to 10 years) another even larger one erupted: Mount Pinatubo - about 10 times bigger. In June of 1991 Mount Pinatubo exploded, ejecting about ten cubic kilometres (2.5 mile3) of material - 10 billion metric tonnes. The broken sections' trends show three distinct periods - level from 1948 to 1982, sudden rise from 1983 to 1995, and dropping since 1995 as the dust settles. You may wonder why the dust would be a cause of INCREASED Global Temperatures. Two factors: One is that the DUST catches sunlight much better than gases. At first it blocks the light itself and causes more clouds that block light, causing COOLING. As the large particles settle, the very tiny one remain and get hot in the sunlight, raising temperatures. The other effect is more obvious: the dust settles on the Arctic ice and helps melt the ice. Once the ice melts this effect goes away. With the dust settled somewhere between 1994 and 1996, the Arctic should have cooled back to normal. It IS getting back to normal, with average temperatures dropping. However, another massive volcanic eruption occurred in 1999 and probably more since then. But this time the eruptions were under the Arctic Ocean - not visible but noted in studies by Woods Hole Oceanographic Institute. Environmentalists tend to not mention these eruptions, since they are under water and not visible. But it does heat the ocean and melt ice. The Arctic Ocean ice coverage has been less each year until 2007, and now is getting back to regular amounts. 2009 summer ice coverage was somewhat less than the 30 year average (we only see the coverage with satellites so there is no data before 1979) but a lot more than in 2007. The volcanoes are finally cooling off. The dust has settled. And some feel that Pacific Ocean currents changed a bit in 2000 - 2007. It is believed that they were moving warmer water into the Arctic Ocean, heating the water and melting ice. The deviation in Pacific Ocean currents seems to have also stopped. Hot Volcanoes, Dust in the Air, or Ocean current changes -it does not really matter. What counts is that the minor change in Arctic Ice Melting patterns has come and gone already. And it relates to known events with nothing to do with Humans or greenhouse gases. Recently, a team of scientists led by Dr. Robert Sohn of the Woods Hole Oceanographic Institution in Massachusetts got a first-ever glimpse of the ocean floor 13,000 feet beneath the Arctic pack ice. Indeed, they were astonished with what they saw. Massive volcanoes had risen from the ocean floor deep under the Arctic ice cap, spewing plumes of fragmented magma into the sea. The eruptions took place in 1999 along the Gakkel Ridge, an underwater mountain chain snaking eleven hundred miles from the northern tip of Greenland to Siberia. Remember, that the record Arctic sea ice melt began in 1999 the same year as these volcanic eruptions began on the ocean floor. The truth is if you overlay the area of melting Arctic sea ice over the area of these massive volcanic eruptions on the ocean floor, a compelling circumstantial case can be made that volcanic eruptions may indeed be the cause of Arctic ice melt.